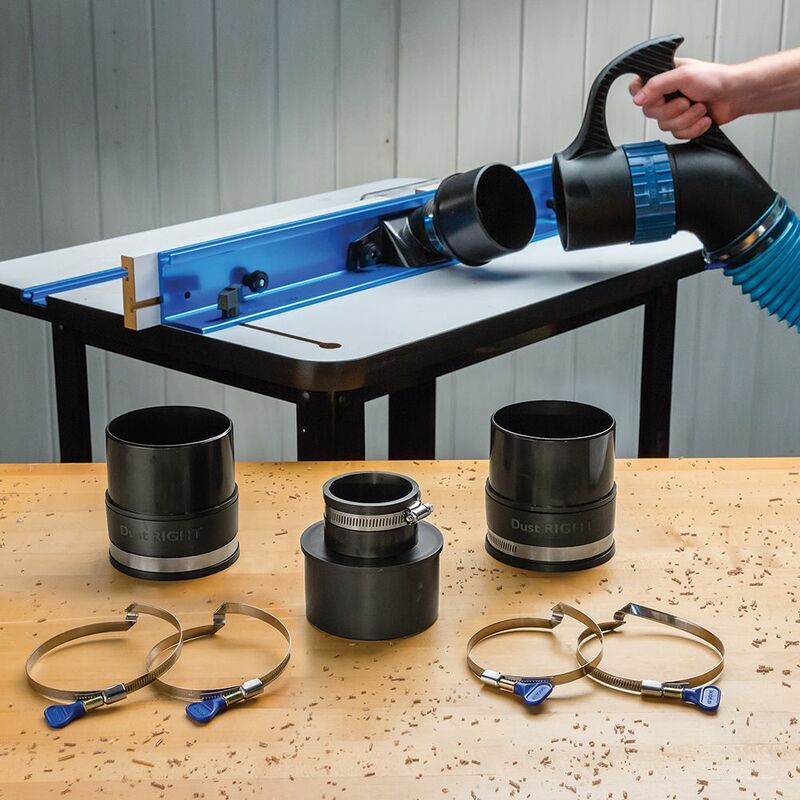 The Dust Right Quick Change Multi-Port Tool Set lets you quickly move a single 4'' dust hose from tool to tool, eliminating the expense of permanent ductwork and a large dust collector. The set includes our Quick Change Handle, which is left attached to your dust hose, and a total of four Tool Ports, which attach via hose clamps to the dust ports on your tools. Once the Tool Ports are installed, the handle slips on and off quickly. The two 4'' Tool Ports are ideal for larger tools like table saws, jointers and planers, while the two 2-1/2'' to 4'' Tool Ports fit nicely onto smaller tools like router tables, small band saws and benchtop tools. Another benefit of the system as a whole is that, with no need for permanent ductwork, your machines can stay mobile, an important aspect of any small shop. 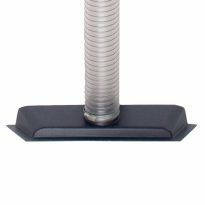 Just keep the handle attached to the 4'' hose on your dust collector and you can move from task to task like never before. Grade addition to my small but functional shop. 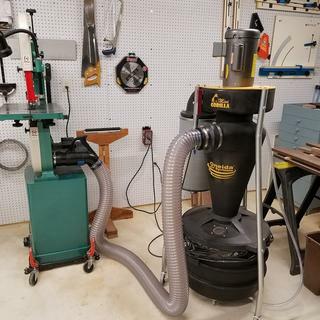 It makes it much faster and less of a distraction to take dust collection to all of my power tools. I only wish that I had done it sooner. Great. Took me a little time to figure the couplings out but once attached went back and bought an elbow and swivel connector that should make hook ups really simple. 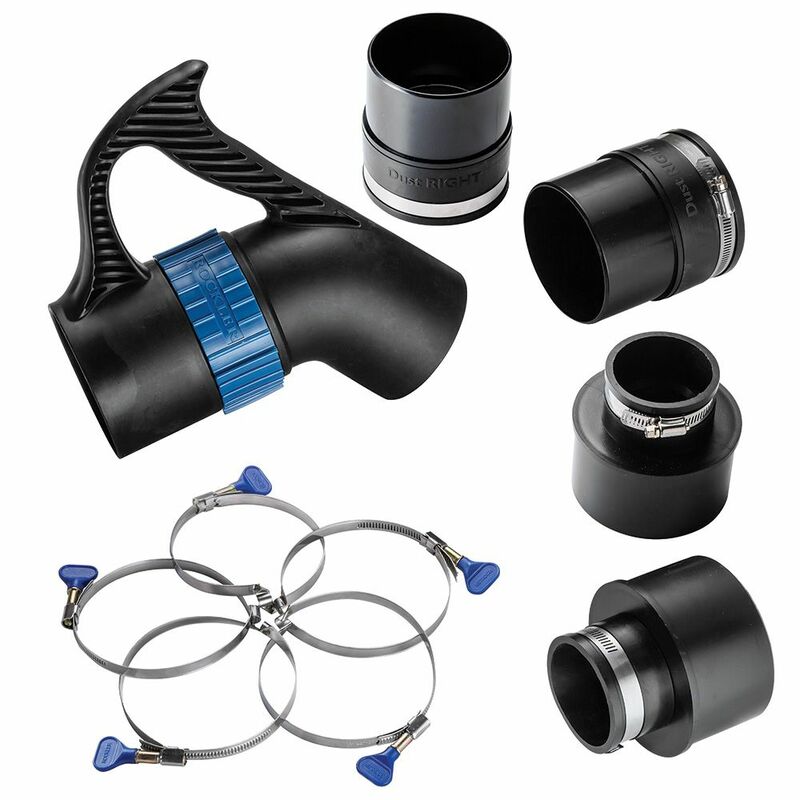 This quick change system allows several of my larger tools to share a common dust collector hose. Great if you don't want to go to all the work of running ducting, tees. etc. Very convenient and works very well. Works great. Nice starter set for a new dust collector unit. A great product once you figure out you really need to heat up the 4 inch hoses to get them to stretch over the different couplings. I use them on my table saw and other wood working machinery in my shop. Great product easy to set up. Gives me the flexibility that I need. . The items in this kit allows me to hook up to an older but still operable dust collector, and draw from several tools in my small shop. I like the handle, but it is too bad I can't buy just the tubing and floor intake for a floor sweeper without having to buy the handle again. Easy to install. The quick disconnect is very helpful. The clamps are easy to add and remove. Concept and system works well - easy to switch from machine to machine. Great kit for someone like me who just upgraded to a real dust collector. I had a jointer and a planer with 4" ports but my table saw has a 2.5" port, and these fittings attach beautifully. It's now so much easier to move my hose between multiple tools. Works great, easy off and on saves alot of time and frustration. 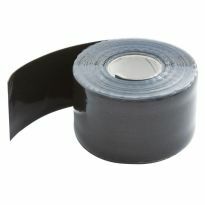 Works great easy off and on saves alot of time and effort. Quick hook up and great versatility. Works great for switching between tools. Attached this all to a Dust Collector and it works just fine. Looking forward to plumbing the whole shop! This is a great tool if you only have one connection and have to move your hose to each tool. Sure is nice. I would definitely recommend this to friends. Well built, works well, really like the system. 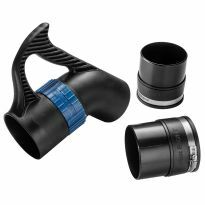 Complaints about the dust right system: 1)the 4" to 2.5 inch adapter could be improved, by making it more funnel shaped. 2) those darn clamps are hard to turn. These are minor issues compared to how well the system works. Very easy to move the hose from one machine to another. It works great. I'm the only one working in my shop so I only need to have one tool hocked up at a time. I don't have my shop setup with all the duct work. 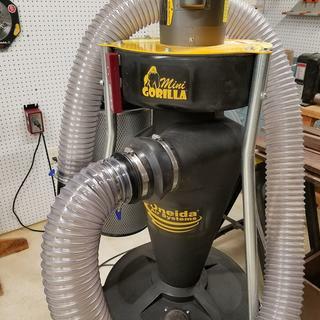 I'm using this system on an Oneida Mini Gorilla dust collector. The combination provides far superior dust collection to my old shop vac/cyclone system. And it's virtually plug 'n play from the band saw to the table saw to the jointer to the planer. One of the best investments in my shop. 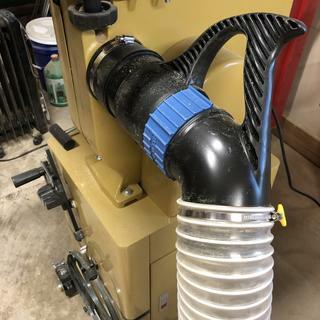 I purchased a new jointer and needed the quick connection fittings for the flexible hose I am using for dust collection. I have found these to work perfectly for flexibility with multiple tools in a garage shop setup. Worked better then expected. I direct connect to the tool I am using and this kit greatly simplified my ability to connect to each tool over previous system I was using. Great product. Works very well, and yes, I'm a professional woodworker. Go ahead and spend the money for these. It will save you in the long run. Nice to finally find attachments that fit!! They work great! I use one 4" hose for my collection needs and have to connect and reconnect with some frequency. Meets my needs perfectly. Good value, perfect fit to machines and gives you versatility. Allows me to move the dust collector from machine to machine in seconds. Keeps the shop clear of messy hoses. This set really speeds up setup. Great value! Simple to use, makes using various pieces of equipment easy with the quick-fit handle. High Quality. Works very well and has adapters for most of my tools except foreign made MM tools. It is great; exactly what I was looking for. 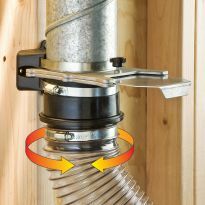 For one who does not want or need the expense and hassle of a hard-plumbed dust collection system, this is a good alternative. I use this system to connect my small portable 1 hp Grizzly dust collector to table saw, jointer, planer, bandsaw, miter saw, and belt/disc sander. I simply move the hose with the handle attached to the machine I'm using. Really no more hassle than opening/closing gate valves on a fixed system. It stores well when used with the Dust Right expandable 4" hose. 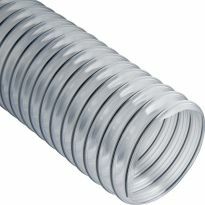 The 3 ft. hose expands to 21 ft, which is more than enough for my 25x25 ft.shop. I did need to buy an additional 4"port to accommodate all my power tools. great product for the price. easily hook up different machines to your collector without any hassle. connections all fit tight. Works great eliminates clamps when switching machine for dust collection. ...if you are using this system. The price is fair, the pieces fit together properly and connect up with most machines. The angled, heavier duty handle part is a big improvement. It all stays connected. Good kit for quickly moving a dust collection hose from machine to machine in a small shop. Could be improved. Nice kit and it does what I need it to do. I couldn’t figure out the band clamps. There is a notch in the band (no idea why) and there are no instructions. I used the clamps I already had on hand. 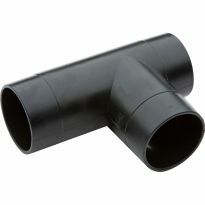 It would be nice to have an adapter to 2 1/2” shop vac hose included in the kit. Shop to small for permanent duct. For ease of transition between tools. To make changing from one tool to another. Makes switch between large port tools simple! for my secondary shop in the basement. versatile package of what I needed to connect to my smaller equipment. I have purchased from Rockler for years using your catalog. I need to hook the hose to my tools, and Rockler is the best!!! Just purchased new 4" vac. Needed accessories. I need the versatility to move the vac hose from one machine to another as easily as possible. Comes with everything I need to quickly change from tool to tool while taking advantage of 4” hose until I get to some of my tools. Decent price savings over individual components. I have a small shop, this way I have less hose laying around. Tools can be moved. Has many components I was piecing out. I think I will need the other two anyway. Old handle broke and I liked the attachments. I have multiple tools to connect (one at a time), and this tool set makes changeover fast and easy (I am told). 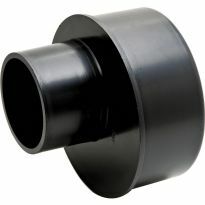 I am hoping that this will help me attach my delta dust collection system to all of my tools. It sounds like a good fit and will update my review after I receive it and have had a chance to use it. My table saw has a 2.5 in OD dust port. Will this work with it? BEST ANSWER: The rubber end on my 2.5" adaptor fit over saw's 2.5 outlet. There is a bit of variation in that the clamp can be tightened down quite a bit, or the outlet built up with tape, and the rubber will stretch out a bit as well, more so with reasonable level of heat and/or silicon spray. Works well for me, far better than my old vacuum cleaner rig. 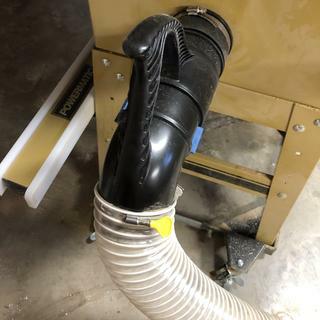 This is probably a dumb question but how do you connect 4 inch hose from dust collector to the tool? BEST ANSWER: So if you're getting this kit, one of the tool ports attaches to the tool. It slides over the intake on the tool and you tighten up on the screw clamp. Then, the hose from the collector attaches to the part with the handle on the 45 degree end and the other end attaches to the port you attached to the tool. That facilitates the "Quick Release" part of this kit. So you would need a port for each tool you wanted to attach the hose to and you then just bring the handle portion to each tool as you needed it. For those who don't have a dedicated run for each tool, this is a really good system. Hope that helps. The hose from the vac attaches to the handle part and that just slips on to the adapters. Light friction holds the handle on to the adapter and there is no issue of things coming apart. 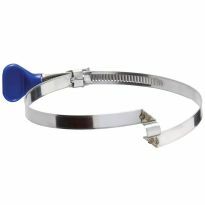 The hose slides over the handle piece and is fastened with a hose clamp provided in the kit. 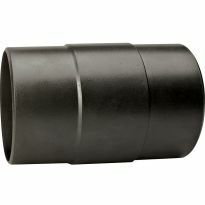 Can someone please provide the Outer Diameter (OD) and Inner Diameter (ID) of both ends of this handle? Thank-you in advance! 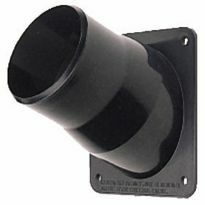 Does this fit a Mini Max machine dust ports? BEST ANSWER: Sorry, I don't have Mini Max ports.